A fun and timely mystery relevant to current day issues. During Woodrow Wilson’s presidency the fight for women’s right to vote came to a head, but the struggle to gain that right was not easy. Many of the women activists were arrested and brutally treated while in jail. Although Wilson did ultimately sign the 19thAmendment, some have wondered if the president was aware of how badly the women were treated and if he approved. Echoes of our times. White House Dollhouse Shop proprietor, Liv Reynolds, is drawn into the still relevant controversy when the Little Theater next to her shop puts on a play about Wilson during the period when he was incapacitated by a stroke, and his wife, Edith, effectively took over running the White House. When Liv’s assistant, who was to play Edith, is killed on opening night, she decides to find out who did it. Then her shop becomes the target of a mysterious vandal who seems particularly interested in the Wilson White House. Are the two incidents connected? Another murder in the theater makes her even more determined to find out what is going on. A fun read with lots of information about several of our First Ladies, particularly Edith Wilson or Mrs. President as she was sometimes referred to. And a reminder of the sacrifices our grandmothers made to give women the right to vote. Kate Wyland, author of romantic suspense equestrian novels. "Barbara Schlichting has combined her love for history and mystery in the clever White House Dollhouse Series. In Edith Wilson: The Fourteen Points To Death, the stage is set—literally—for another intriguing plot, leaving the reader to try to figure out whodunnit. I love how Barbara takes an historical event and builds a modern day mystery around it. She shines at breathing life into our country’s former First Ladies, and Edith Wilson was a great choice for this story." Christine Husom, author of the Winnebago County Mysteries and the Snow Globe Shop Mysteries. You'll feel like a passenger on the Zephyr train as author Barbara Schlichting leads you through the Midwest to find a killer in this World War II era story complete with spies, agents, colorful passengers, and an unexpected romance. It is a well written murder mystery just like her 1st Ladies Mystery Series. I love how she mixes fiction with real facts of history. That makes it interesting. Looking forward to reading the next book in the series yet to come out. Soon I hope? Keep up the good work Barb...proud of your accomplishments. ​EDITH ROOSEVELT: CLUE OF THE DANCING BELL. Barbara Schlichting’s First Lady Dollhouse Mystery Series is a delight! In Edith Roosevelt: the Clue of the Dancing Bell, the third novel in the Dollhouse Series, Olivia Reynolds, owner and operator of the First Lady Dollhouse Store in Minneapolis, attends a National Park expo at the Xcel Energy Center as a vendor and as a fan. Liv leaves her employee, Gina, at the First Lady Dollhouse booth while she attends the opening ceremonies. Gina drinks a beverage meant for Liv, and dies. Liv is beside herself. Someone has murdered her friend and employee, and now it’s up to her to figure things out. Enter an old land title, which may or may not have belonged to Teddy Roosevelt, a couple of assaults, a deranged murderer, and suddenly Liv has her hands very full. Entertaining, informative, and always fascinating, Schlichting delivers another Teddy bear hug of a mystery! 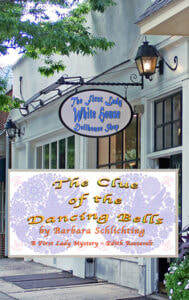 I love these cozy mysteries, by Barbara Schlichting! With the world so complicated these days, A FIRST LADY Mystery Series where Modern characters make History, are feel good books that are great to cuddle up on the sofa, or better yet, in the bathtub. A delicious escape while you learn history! Love these cozy mysteries, by Barbara Schlichting! With the world so complicated these days, A FIRST LADY Mystery Series where Modern characters make History, are feel good books that are great to cuddle up on the sofa, or better yet, in the bathtub. A delicious escape while you learn history! “An unexpected discovery of letters from Dolley Madison should excite Liv, but instead it leads her into a tangle of theft, murder and bewildering clues. DOLLEY MADISON: A Blood Spangled Banner draws upon important historic facts to solve a modern-day mystery.” Beth Solheim, author of At Witt’s End and Outwitted. Author Barbara Schlichting blends American history with modern-day murder in this charming debut mystery. "Liv Anderson, a distant descendant of Dolley Madison, owns a shop that features intricately crafted First Lady dolls, as well as handmade White House reproductions. First Lady enthusiasts flock to Liv’s shop, but not all have noble intentions. When one of those enthusiasts is murdered, Liv realizes that her own safety is in jeopardy. Aided by her grandparents and by her police officer fiancé, she embarks on a mission to unravel the secrets of history . . . secrets that might well get her killed. I enjoyed following Liv on her exploits to expose a deadly killer, but even more fun was the discovery of the historical artifacts as the story progressed. The ending was terrifically satisfying, with all the stray knots tied neatly into place. I’m anxious to read book two in this delightful new series!" I must admit that at first I was thinking that this cozy might just be too cozy for me. Then, I opened the novel. What had seemed as a too 'theme' conscious book, was in reality, one heck of a suspense mystery novel. Ms. Schlichting, whom I first learned about on 'Twitter' has an incredible knowledge of Presidential First Ladies of History, and an incredible sense of storytelling. True the heroine, Olivia is enamored with her beau, Aaron. True, Olivia has a relationship with her Grandparents that defies most families. True, Olivia is unusual in her business relationships (with the First Ladies.) Also, true is the fact that the story grabs you, presents multiple possible suspects, has you trying to figure out truth from fiction and then not caring about it at all, and finding out you wish History followed some fiction. Finally, you have on-page action and you find yourself trying to figure out just what the 'Secret' is. With multiple red-herrings...you end up sighing at the ending and going to see if the Author has written any further editions in the series...yes, she has!